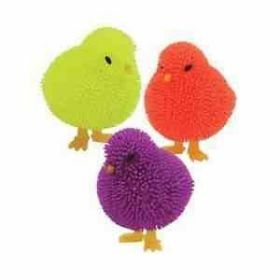 Each chicken or duck ball is approx 3" tall, is made from really soft tactile flexible rubber and is full of air so can be squashed into all sorts of weird and wonderful shapes. The only difference is the beak, so you would usually be sent a mix of styles and colours if ordering more than one. Each has a flashing LED unit inside which is activated when you bang, knock or bounce the chicken. It then flashes for 10-15 seconds before automatically switching off, extending battery life.